Whether you're in the woods or in the midst of a disaster such as an earthquake or a zombie apocalypse, if there's no cell service how are you going to keep in touch? I recently signed up to attend a local Community Emergency Response Training (CERT) course here in Ventura, California. Why? Because if really bad stuff happens, for example, if there's a serious earthquake (it would be our own fault), a tsunami, a zombie apocalypse, or we simply run out of Cabernet, then **** will get real and the chances of the authorities being able to do much of anything for a long time in a large scale disaster scenario are slim to none. So, having some idea about what to do and what not to do would seem to be a good idea. Of course, there’s the basics which we all should have in case of emergency which includes having a stockpile of drinking water and food, a supply of whatever medications you need, first aid supplies, and things like tarps, plastic sheeting, and blankets (you might also check out the Mormon community in your area; those people all have a two-year supply of food they maintain, er, religiously, and are incredibly community-minded). But what about communications? In the event of a disaster of any magnitude, your electrical power will go out, your Internet will go down, and your cell service will most likely disappear. Walkie talkies are a good idea for keeping in touch with your friends and loved one but what device do we all have that we rely on? Yep, smartphones. And smartphones can do stuff that walkie talkies can’t such as geolocation and mapping. So, making your smartphone into a communications device that doesn’t rely on cell service is a good idea and that’s exactly what a product (and company) called goTenna has done. 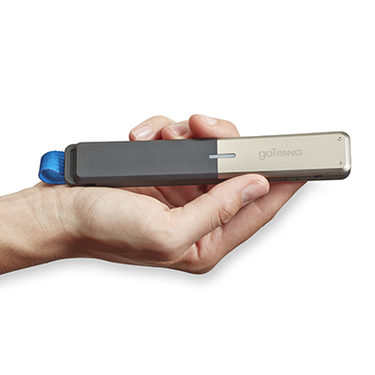 The goTenna is a small, stick-like device (5.8 inches long by 1 inches wide by 0.5 inches deep, weighing 1.8 ounces; when the antenna is pulled out it’s about 8 inches long) that houses a 2-watt VHF radio which connects with a smartphone app (iOS and Android are supported) via Bluetooth LE. It’s dust- and splash-proof and has a snap-fastened strap so you can attach it to your belt or backpack or whatever. The free smartphone app that connects via your goTenna can communicate with other goTennas over roughly one mile in urban areas and up to about four miles in more open terrain. The goTenna is powered by an internal rechargeable LiPo battery that is good for about 24 hours in standby mode (that is, when it’s just listening for messages) and it has a concealed micro USB connector for charging. Setting up the product is simple and involves downloading the app, pairing with a goTenna, allowing the app to get location data from your smartphone GPS, enabling access to your address book, and allowing the app to generate notifications. You can also download maps from goTenna but, be warned, their servers are really slow (I’ve been trying download the California map for well over an hour but with interruptions I have yet actually finish the process because every time I have to stop, the download has to restart from the beginning which is ridiculous). Shout Chat and Emergency Chat messages are sent unencrypted while Group Chat and 1-to-1 Chat messages are sent encrypted using 384-bit elliptic curve public-private key ciphering. The messages are also stored on the goTenna in the encrypted format while the decryption key is only stored on the smartphone; this means that without the smartphone, the stored messages are unreadable. It’s also important to note that the messages are sent directly from one goTenna to another, there’s no intermediate server where anyone (cough, NSA, cough, FBI, cough CIA) can perform a “man in the middle” attack. Another feature is that even if your smartphone is off, a goTenna that is switched on will store received messages. These message will be downloaded to your smartphone as soon as you fire up the app and after it connects to the goTenna the messages will be decrypted. I tried the goTenna system at distances up to around half a mile in an urban setting and it worked perfectly. Way cool. Now I characterized the goTenna in terms of disaster preparedness but it also has more prosaic everyday uses including traveling outside of cellphone coverage (for example, when hiking) as well as in locations where cell service may be unavailable due to overuse such as at CES or Disneyland (Dad to Mum: “Honey, I’m still at Small World and you have the Excedrin. For the love of God, please get over here.” Mum to Dad: “When I’ve finished this martini.”). So, what’s bad about the goTenna? Not much though the app is rather version 0.x with some annoying bugs (for example, I switched off my goTenna and the app told me “Your goTenna was disconnected” and clicking on “OK” repeated the message; I had to restart the app to get out of the warning screen). There’s also the previously mentioned really slow map downloads, the featured but not findable Emergency Chat [Update: It's hidden under Settings], and when I deleted all of my map “pins” the summary screen claimed I had “18…” pins in total. Moreover when I created two new pins the app claimed I only had one, Sure, I know that miscounting pins is a minor problem but minor problems always make you uncertain as to what other possibly major bugs might exist. My final grumble is that a message that didn’t get delivered wound up "stuck" as being delivered while other messages that hadn’t been delivered could be retried successfully. Problems aside, this is a killer product. In fact, it’s got huge potential for all sorts of emergency services and civil communications and the promised API will, I predict, create a whole ecosystem of novel communications apps. So, how to rate the goTenna, which is priced at $199 for a pair? If I think that in terms of what it is now, the goTenna gets a Gearhead rating of 4.5 out of 5. If I think of what it could and should become, I’d give it a 6 if I could. Thoughts? Suggestions? Send me feedback via email or comment below then follow me on Twitter and Facebook.